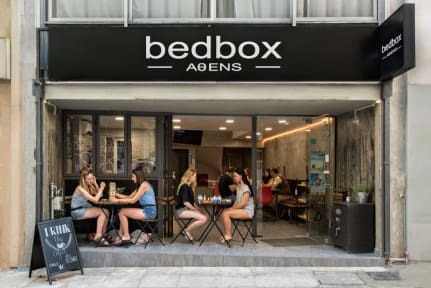 Bedbox Hostel i Aten, Grekland : Boka nu! Bedbox is a modern Hostel that features a terrace, a shared lounge, a big and well equipped shared kitchen with a fridge and all that you need, it has also an onsite bar. 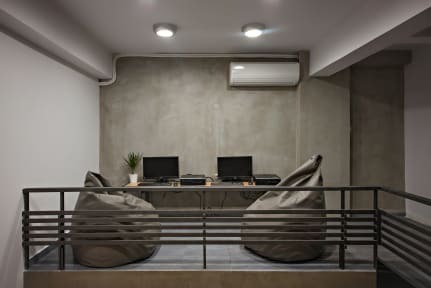 This hostel offers a 24-hour front desk and free WiFi. We ensure you a pleasant stay. Our location is privileged because we are in the very heart of the city. From our facilities you can reach some of the best attractions and most renowned landmarks of the city just walking. Landmarks such as Roman Agora, National Garden, the Old Olympic Stadium and the Acropolis are truly accessible from our facilities. Furthermore, you can always visit easily from our facilities some of the less tourist part of the city such as Exarcheia, the anti capitalist quarter that will show you a whole different face of Athens. Super comfy beds with curtains for extra privacy, each bed has also its own power plug and a led reading light. Big lockers where you can store your things. Locks are provided with no extra charge. Laundry service is available with extra charge. Hairdryers are available on request with no extra charge.